Someone should give Don Voisine a medal for sticking so rigorously to one format for so long! As a fellow painter I stand in awe of those like Voisine who continually manage to mine the same restrictions, and invariably come up with something new. Voisine’s current working method, which goes back a decade, if not longer, has focused on a handful of elements, derived in a graphic as well as a semiotic sense, from an earlier period when he based his drawing on the architectural floor plans of places where he lived or worked. Don Voisine, L to R: “Projector,” 2012. Oil on wood panel, 18 x 18″. “Drop,” 2011. Oil on wood panel, 18 x 19″. “Stygian Sky,” 2012. Oil on wood panel, 18 x 19″. “Incorrigible,” 2011. Oil on wood panel, 18 x 18″. Courtesy of the artist and McKenzie Fine Art, Photo by Brian Buckley. First, you have what I like to call the “bumpers.” These are two parallel bands of color that hug either the top and bottom edges or the left and right edges. Each band is usually highlighted by a line of color on the inside edge, or on the outside edge or both. One piece on his website, Full Stop (2011), has a line of color running down the center of each band. Next you have the central figure, which consists of a rectilinear glossy black shape, often cropped. Then you have an underlying matte black figure, which can be a rectangle, or a series of apparently intersecting rectangles, or perhaps bands. Finally you have the white “ground” beneath the two black figures, although Voisine plays all kinds of games to activate the white spaces into shapes in their own right. And there you have it. Simple right? Well, not really. A close look at Projector (2012) raises a number of questions. What is happening in the matte black areas? Are they stripes of color or are they shapes that are sliding underneath the central glossy black rectangle? Are the matte black-and-white shapes actually a frame around the glossy black rectangle? And what is the relationship between the black-and-white central figure and the “bumpers”? Is the black-and-white area actually obscuring a field of maroon, leaving just the bumpers exposed, and what of the blue lines at the inside edges of the bumpers? But more importantly, what kind of feeling do the shapes convey? 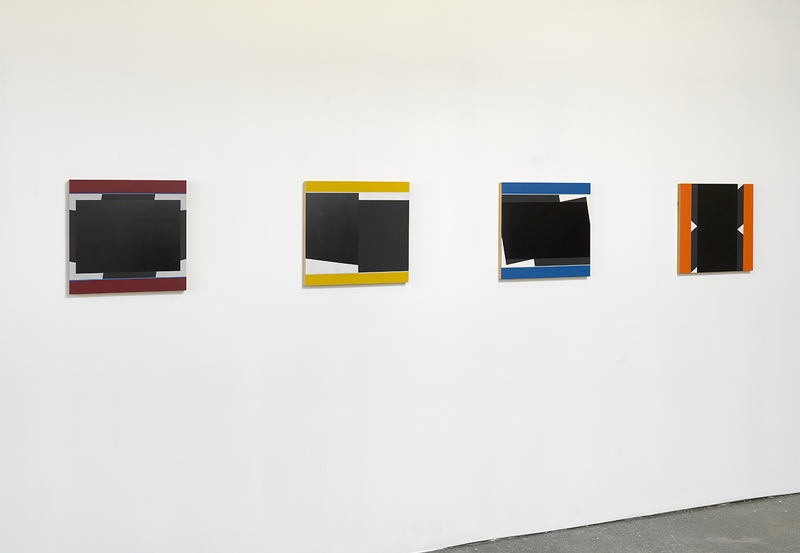 Voisine’s central compositions of overlapping black shapes have gradually, over the last five years, developed more dynamic relationships, which give a greater sense of compression and instability to the overall composition. In other words, Voisine manages the very difficult feat of giving his geometric elements ever more expressive weight almost entirely through formal manipulations. Is there a deeper narrative lurking underneath all these shifts? Hard to say, but that mystery is yet another reason why Voisine’s paintings continue to hold their own in a very crowded market of geometric abstraction.